We could be making some car journeys between these towns and so here is a chart giving us some information about distances and times. These numbers show us direct routes. But now, suppose we go on journeys involving three or four cities. 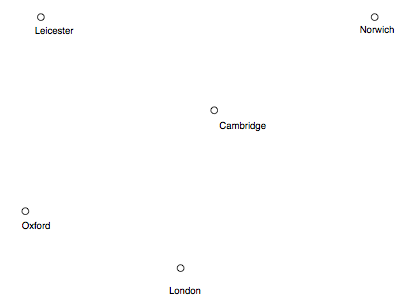 For example, we could go from Norwich to Oxford but go through Cambridge on the way. Or, we could go from London to Leicester but go through Oxford on the way. What other journeys involving three or four cities can you find? 1. What is the total distance of your journey in kilometres? 2. How many minutes long is your journey? 3. How much longer (in terms of time) is the journey when passing through another city or other cities along the way compared with the direct journey between the starting city and the final destination? What about the shortest route for visiting all five cities? How much longer does it take to travel the longest route compared with the shortest route? Trial and improvement. Working systematically. Combinations. Time. Length/distance. Generalising. Multiplication & division. Investigations. Addition & subtraction. Interactivities.